Birds Of A Feather: Tastefully Tacky...@ church? The church called and asked me to help design and create a tastefully tacky window display. Our church is housed in an old furniture store. So I (along with Jen from Fotojenik) got to create a storefront Christmas window. We started with a borrowed fireplace surround and then pretty much everything else came from my house. Hmmmm...all the tacky stuff came from my house. That's the first time I've said it out loud. Maybe this was less about the window and more about a style intervention! Everything except the photos! (those are not my people) If you have never been to awkward family photos go here NOW. We thought the photos went nicely with our tastefully tacky vintage Griswald theme. We threw a piece of chalkboard on plywood behind the fireplace and I whipped up a little fire and ambiance. Did you know Dollar General sells trees? Nice big fluffy full white ones? The deer head was in Jackson's room a few years ago. We dressed him up for the holidays with some fab fabric and a frame. The window goes along with the series our Pastor started this week, Best.Christmas.Ever. This was such a fun project and I love the outcome even if all the "tacky" stuff came from my house. What do you think? Tacky enough? Now that's stepping out of your stylish box! I do have to say I like that brass and glass side table next to the patchwork chair - and the white lamp sitting on it! 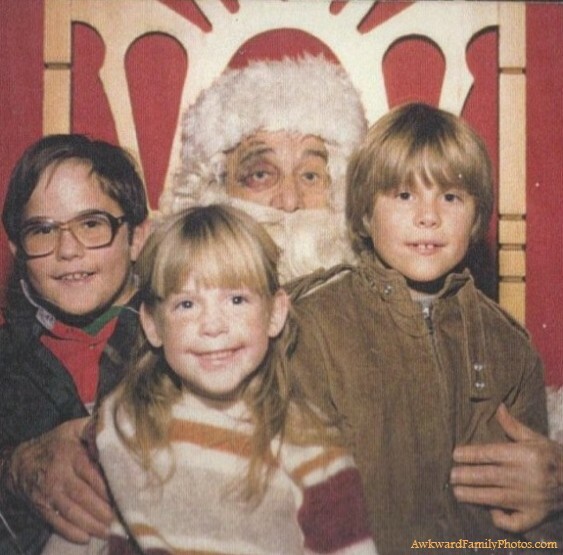 Yes, and that's the first black-eyed Santa I've ever seen - and hopefully the last. very tacky in a nice tacky stylish sort of way! love it! and that's a pretty rad church.